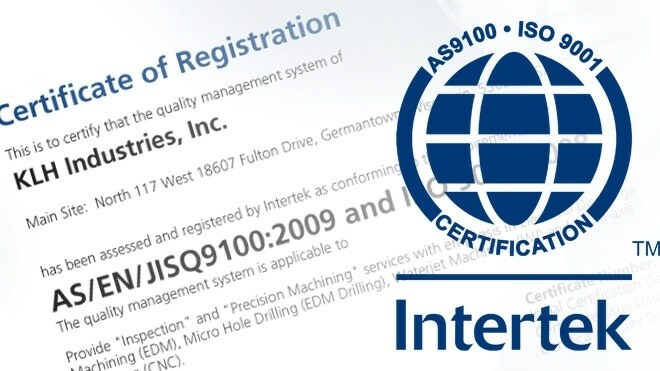 KLH Updates to AS9100:2009 Certification | KLH Industries Inc.
By passing an audit by accrediting body Intertek, KLH is now certified to AS9100:2009. This is noteworthy for any companies who keep a copy of supplier certifications on file, as all AS9100 Rev. B certificates will be invalid by July 1, 2012. The scope of this certificate applies to all EDM machining, CNC machining, waterjet cutting, and dimensional inspection services. Some familiar with AS9100 might be expecting revision letter C. Rest assured, AS9100 Rev. C and AS9100:2009 are the same. The International Aerospace Quality Group (IAQG) seems keener on appending the revision year rather than the revision letter, although both are to be used interchangeably at this point.